I've decided to put myself on a January NO BUY! I did quite a bit of damage in December, so my bank account will thank me if I stop buying things, especially nothing I REALLY need. I did make some pre-christmas/boxing day purchases for myself, when there were some decent sales. I thought I made this purchase on boxing day, but it was before Christmas according to my confirmation email. No big deal! Let's get a look at everything! Now I'm not sure if the sheet masks are always on special with TheFaceShop because I've never actually gone into the store (although there is one like 5 minutes from me... oops!) and this was the first time I shopped on their website. But the sheet masks were buy 10 get 5 free. Which works out to be like $1.33 per mask. They are regularly $2 each. 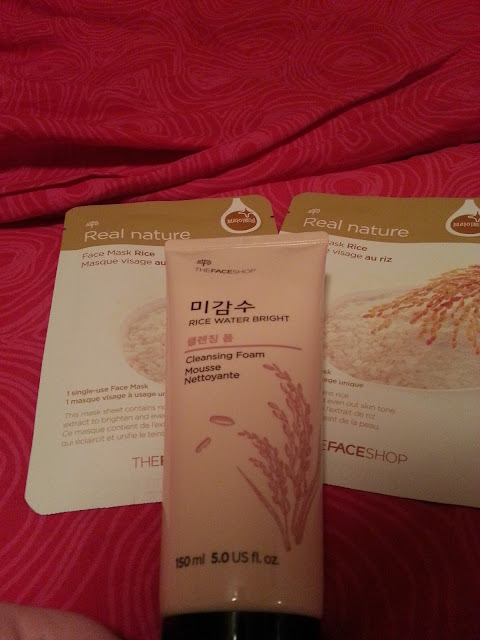 I enjoy TheFaceShop sheet masks and I made sure to stock up on the rice mask, since it is my favourite by them! In this picture we also have Around the World New York Face Care Set, Around the World Paris Face Care Set, and a pouch full of TheFaceShop Essentials! 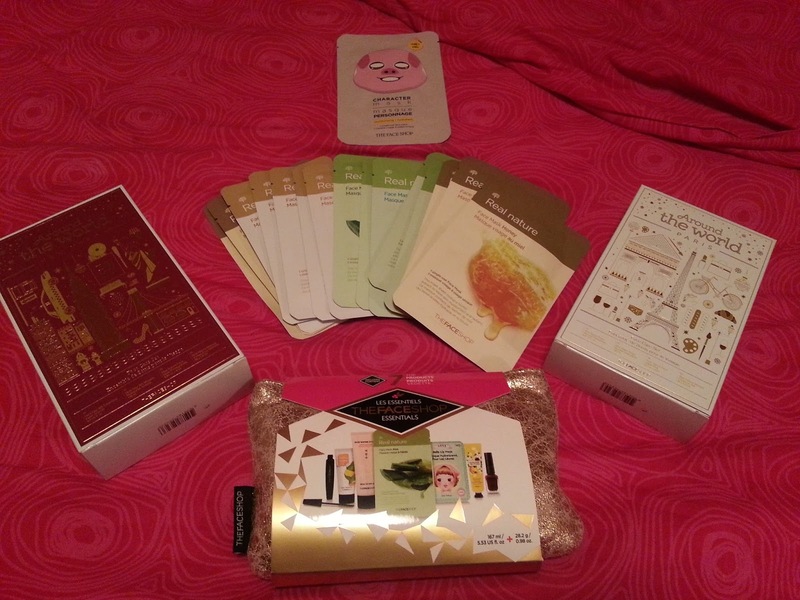 The piggy sheet mask was free with a purchase over $35. I was hoping to get the super cute reindeer mask, but I guess they sold out, and we weren't given the choice. But it's still cute, so I'm happy! What's a little weird about this is that the box says the around the world part, but on their actual website this is just called the Herb Day Face Care Discovery Set. 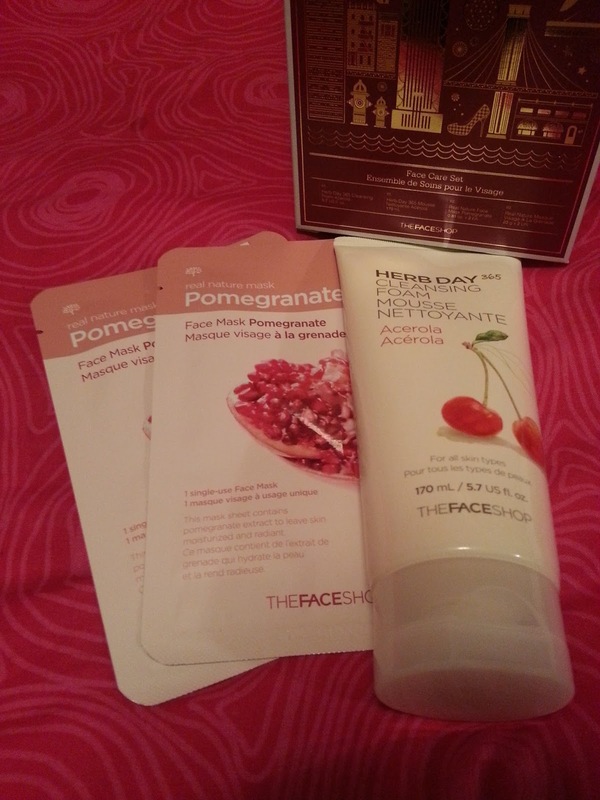 This set includes 2 Pomegranate sheet masks, and a Herb Day Cleansing Foam. This retails for $8. The cleanser alone is $6, and it's full size. As soon as I saw this set I wanted to have it lol. I love the rice masks, and I love my Rice Ceramide Moisture Toner and Emulsion. I figured I would probably love the rice water bright cleansing foam as well. This set retails regularly at $10. The cleanser isn't full size, but at 50mL it will still last a while. 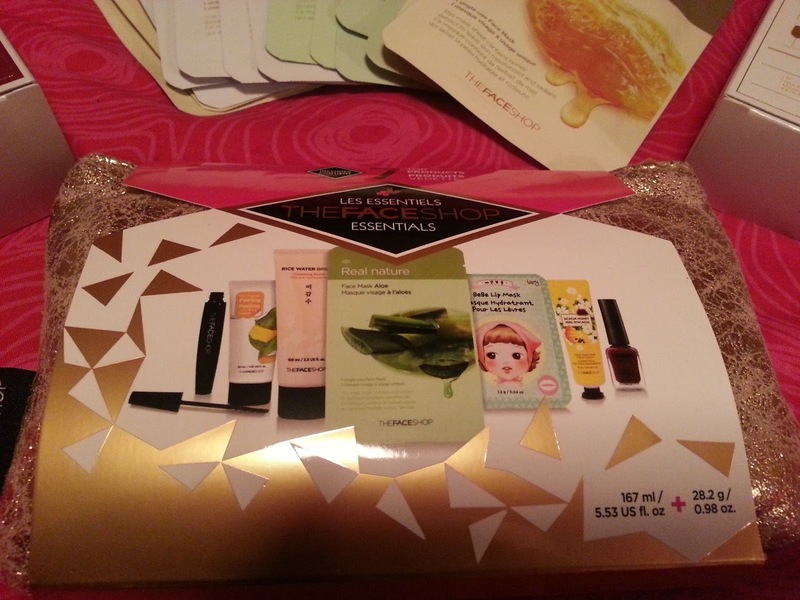 This kit includes 7 of the most popular products they sell, inside of a soft gold clutch. Let's get a closer look at what's inside! Peeling Mild Papaya Face Mask, Acacia Honey Hand Cream, Real Nature Aloe sheet mask, a dark reddish nail polish (it doesn't have a name on it - it's kinda like the Formula X Ignite shade, but more red), Freshian Volumizing Mascara, Rice Water Bright Cleansing Foam, and a Bebe Lip Mask. This set retails regular price at $29. I'm most excited to try the peel off mask, the lip mask, and the mascara as well since I've never tried their makeup line. I didn't realize I got 2 of the rice bright cleansing foams, so hopefully my skin doesn't hate it! When I made my purchase, they were having a 40% off sale if you purchased 3 or more gift sets, and the sheet masks were buy 10 get 5 free, and then the free character mask with a purchase of $35 or more, AND free shipping on orders over $45! So while my subtotal would have been $77, with all of the savings, it was only $48. I now have quite a few sheet masks, and I get to try a bunch of new products. I'm looking forward to trying everything, and I will keep you all updated as I go along! Oh, I'm on a no-buy too for Jan! Too much shopping!!! 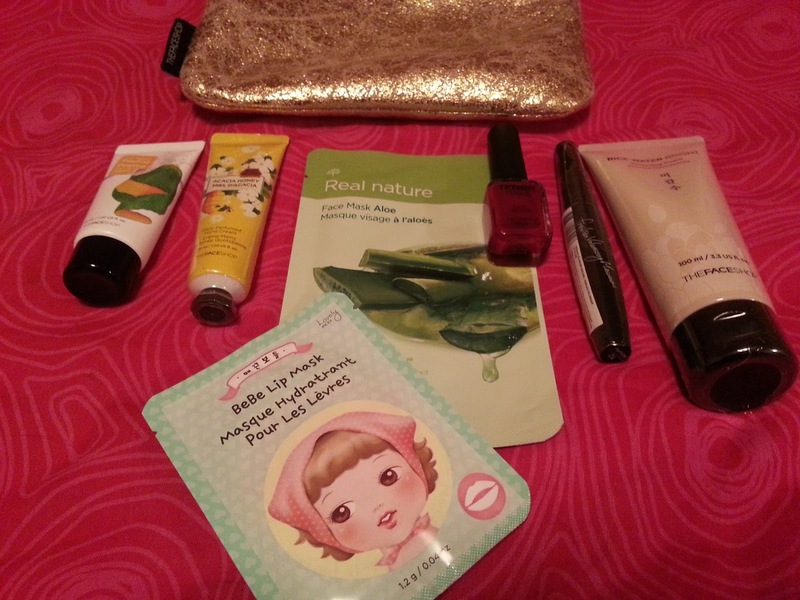 I got the Face Shop Essentials Kit too - I can't wait to use the lip mask! Me too... wayyyy too much shopping! lol. I'm excited to try the lip mask too! I've never used one!